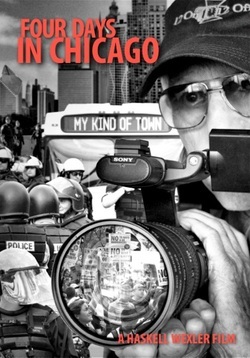 Academy Award-winning filmmaker and lifelong activist Haskell Wexler takes a personal look at Chicago over four days in May 2012 -- four days filled with politics, protest and police. The Occupy movement, the National Nurses Union, Iraq Veterans Against the War, Code Pink and others converged on Chicago to tell President Obama and Mayor Emanuel to stop the insane spending on wars around the world, and bring the money home for housing, schools and healthcare. Police were brought in from other states, and Mayor “1%” Emanuel spent $27 million to secure the city against the “threat” of citizens speaking out. It was a huge event in Chicago, but the national press wouldnʼt cover it; hardly anyone outside the city even knew what was happening. All the American media fed the people were sensationalized images of a menacing Black Bloc; they suppressed stories of intelligent Americans exercising their constitutional right to protest. Emanuelʼs decision to militarize the city to protect the war-makers of NATO raised a key question: is the government of the people, by the people, and for the people -- or is it of, by, and for the 1%?